Bougainville is facing arguably its biggest challenge since 2001, as the Autonomous Bougainville Government (ABG) attempts to push through major amendments to its Mining Act, reportedly at the behest of Western Australian businessman, Jeffrey McGlinn. Last week Mine Watch exposed the links between McGlinn, Qamar Khan and Belden Namah. Namah has mysteriously been on Bougainville meeting with President John Momis. Now we have in our possession a document purportedly written by another Western Australian, David Johnston. Image: Former Australian Defence Minister, David Johnston, the current Chairman of Kalia Limited. Johnston is a former Minister for Defence in the Australian Government (famously known for being embroiled in an expenses scandal), and is currently Chairman of Kalia Limited which is laying claim over mineral prospects in North Bougainville. But it is Panguna mine to which this leaked document pertains. 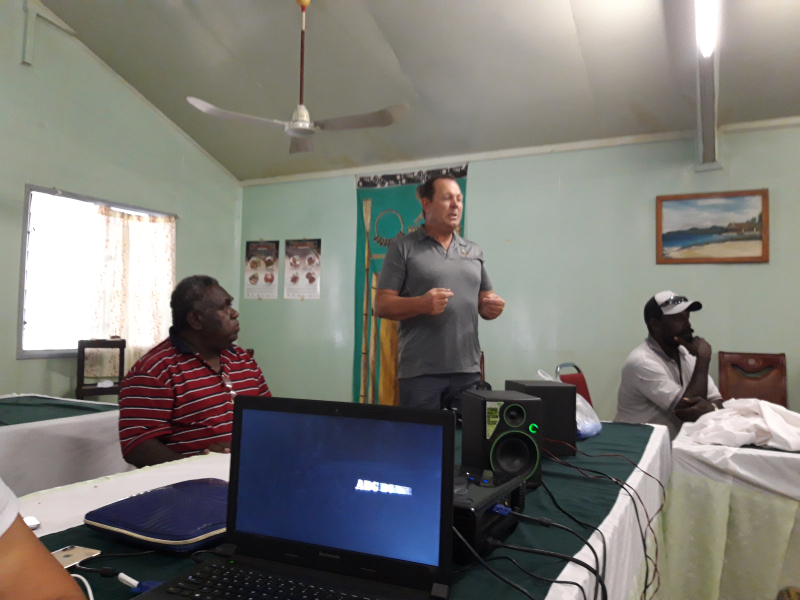 It is a consultancy report written for the ABG, and the advice solicited by the named author, David A L Johnston, is a blueprint for the current mining coup underway in Buka. The top secret document solicits advice to the ABG on how it can rapidly raise revenues – which by all accounts are being lost just as rapidly to corruption – through a radical plan to reopen Panguna. The document, written in August 2017, claims Bougainville Copper Limited has ‘lost [its] social licence to operate’. This references the considerable body of evidence linking BCL to environmental devastation, war crimes, and other egregious human rights abuses. Shortly after the consultancy report was submitted to the ABG, President Momis, in effect cancelled BCL’s renewed bid to obtain a mining lease over Panguna, telling the media: ‘The people felt BCL no longer deserved the social licence’, a statement seemingly taken almost word for word from the consultancy report. However, the report does not argue for a long term moratorium on Panguna while the wounds of the past heal. To the contrary it encourages a radical coup designed to rapidly reopen Panguna, using a shady offshore system of corporate ownership and ‘shadow Directors’. The report argues that the ABG should organise experienced ‘shadow directors’ to advise its appointees on BCL’s Board, allowing them to access critical commercial-in-confidence records essential to the proposed mining coup. 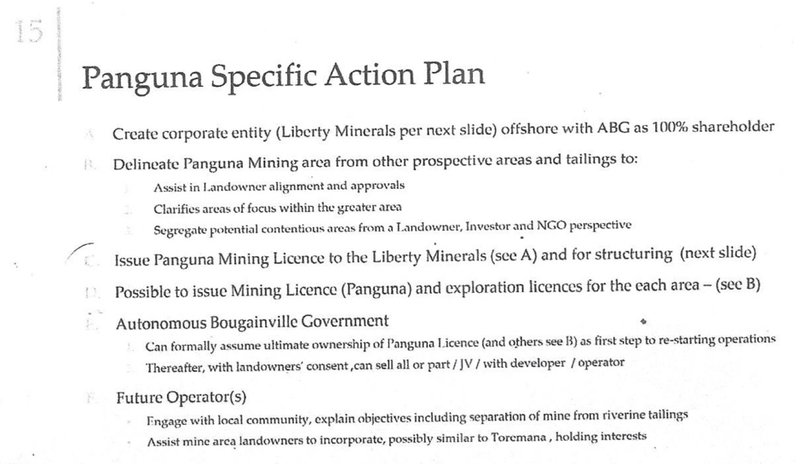 The consultancy report then argues for issuing a new mining license to an offshore corporate entity, Liberty Minerals, with the ABG as 100% shareholder. From here, it continues, the ABG can enter into a joint venture with a new investor to reopen the Panguna mine. The structure mimics what is currently being advocated for by the Bougainville President, except Liberty Minerals is to be known as Bougainville Advance Mining and the foreign ‘partner’ has a name, Caballus Mining, led by McGlinn. Mine Watch has already detailed the links between Belden Namah, a man implicated in high profile corruption scandals in PNG, and Jeffrey McGlinn. The question then is, what is the relationship between fellow Western Australians, David Johnston and Jeffrey McGlinn? The amendments being argued for by McGlinn, with the full backing of President Momis, appears straight out of the playbook set out in this consultancy report, which is purportedly written by Johnston. Whatever the answer is, it appears as Bougainville approaches the independence referendum, meddlesome hands from the former colonial power, are all over the ABG. We have Bougainville Copper Limited (BCL) vying for Panguna under Australian management. BCL claims it is the rightful mine operator. For a time, Momis argued BCL enjoyed overwhelming support from landowners (they didn’t), and his government. The President in a series of letters launched scathing attacks on local and international advocates, who argued BCL should be held to account for past injustices. Later it was revealed that the letter metadata showed they were penned on the computer of another Australian adviser to President Momis, Anthony Regan. Now the relationship with BCL has cooled, Momis recently told Radio New Zealand: ‘Bougainville Copper … got away with trillions and they gave the people of Bougainville, the landowners included, a pittance. They destroyed our environment, destroyed our land, exploited the place’. Then there is RTG Mining, an Australian company, which claims it, not BCL, is the rightful operator: ‘RTG Mining Inc is the nominated development partner with the joint venture company, Panguna Minerals Limited, established by the Special Mining Lease Osikaiyang Landowners Association and Central Exploration Pty Ltd, in their proposal with respect to the redevelopment of the Copper-Gold Panguna Project located in the Central Region of the island of Bougainville, within the Autonomous Region of Bougainville, Papua New Guinea’. RTG Mining is linked to Australian Renzie Duncan, and Bougainvillean, Philip Miriori, both of whom have a questionable track record. It appears this corporate faction do not enjoy the backing of President Momis. Now to the mix we can add McGlinn’s Caballus Mining and Bougainville Advance Mining, a third contender for the Panguna mine, which operates with the President’s full support. 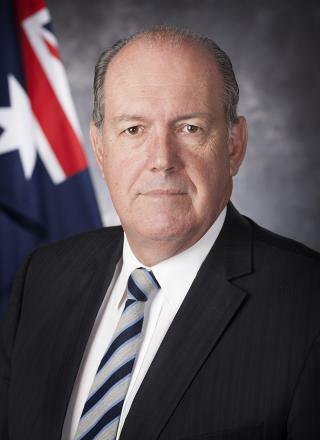 The roles played in this faction by former PNG Deputy PM, Belden Namah and former Australian Defence Minister, David Johnston, is still to be clarified. Deafening is the Australian government’s silence as its citizens wreak havoc on Australia’s so called strategic doorstep. But one thing is for certain, foreign corporate cabals sense blood in the water, with a weak and deeply corrupt ABG, ailing under the leadership of President Momis. Meanwhile, landowners continue to make their opposition to the resumption of mining in Panguna known, regardless of which Australian conglomerate takes over. Plenty of ideas circulate Bougainville on how to create a sustainable future, even if it falls on deaf ears within the ABG. While late last year NGO, Jubilee Australia, released a new report that contains voices from Bougainville and abroad, on sustainable alternatives for funding a potentially independent Bougainville – read the report here. Of course, sustainable solutions that rely on the savvy of locals it seems are no match for pipedreams being sold by Australian businessmen, who appear to have a monopoly on the President’s ear. And the professor from the Australian National University (ANU) in Canberra, Tony Regan still has his feet in two camps. The “pro PNG” government and BCL camp whilst advising the Bougainville government camp. Time he was exposed.